Minus33 sent us free product for the sake of this Chocorua Men’s Midweight Wool Crew review. This in no way shapes our opinions in this post, it just makes bringing you deets affordable, and I’m okay with that. We recently went on an epic adventure. An adventure that took us from Pigeon Forge into the Great Smoky Mountains and the length of the Blue Ridge Parkway into southern Virginia. With the temperatures starting to drop as the leaves changed we were stoked to experience Fall in the Mountains! We stayed in the lovely Black Fox Lodge, in Pigeon Forge our first night. And we knew that the mountain adventure ahead of us would have some colder nights when it came to weather. I’m so glad I packed Sean’s Minus33 Kancamagus Men’s Midweight Wool Bottom and Minus33 Chocorua Men’s Midweight Wool Crew. I knew we would need it but I had no idea just how much. Great for: hiking, camping, snow sports, hunting, fishing. The Minus33 Chocorua Men’s Midweight Wool Crew is versatile and comfortable. Designed as a three-season garment, it works great as either a base or mid layer. The Midweight styles have all the same natural qualities as the Lightweight Merino Wool, with greater insulation. Minus33 Merino Wool Clothing is perfect as a base layer for a day on the slopes or as an emergency pullover when a cold front rolls in just before you summit. In our case, it was perfect for chilly mountain mornings and cool nights by the fire. There were two nights in particular that the wool bottom and wool crew came in dire need. The first night was when we were tent camping at 33 degrees. No joke, it was pretty cold. Sean had his layer of Minuss33 wool on and I remember feeling how soft it was… then immediately thinking how jealous I was that I didn’t have my own set. I need to work on that! 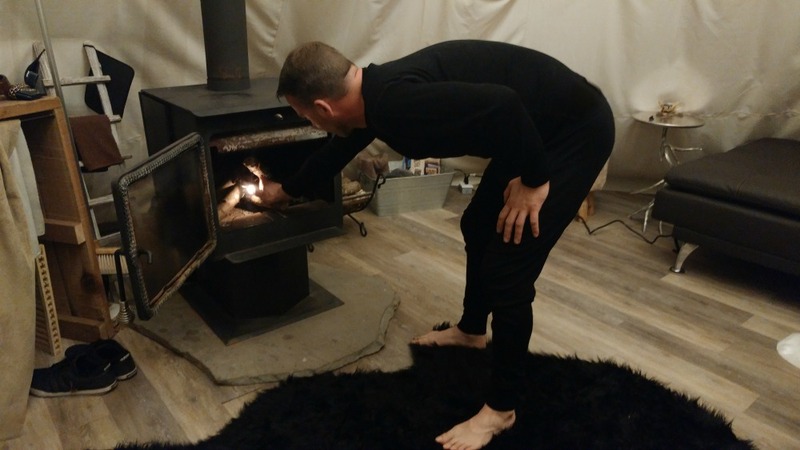 Sean said he was never cold, he even got up in the middle of the night to check the campsite without a flinch. Meanwhile, my son and I were huddled together with the dog, looking for warmth. The second time he needed them was when we stayed in a fabulous luxury teepee (our last night of the trip). We had a fireplace inside but were too afraid to keep it burning overnight. So Sean slipped into his bottoms and crew again and was happy as could be. I can’t get over how soft and NOT itchy the material is! Sean loves the set, he’s never going to another cold place without it. Now I have to work on getting myself and my son a set for our future adventures! I will say though, the price point is a little high for my taste but well worth the quality. We will have this set for many, many years. So I feel it’s a good buy for what you’re getting. Plus, you never want to gamble being cold in the woods! For more information about these products check out the Minus33 website! Soft, Comfy and Warm When spending your money on cold weather gear, you want to be sure you're getting something that's comfortable, does the job, and has the quality to live up to the price. The Minus33 Chocorua Men's Midweight Wool Crew doesn't just get the job done, it makes you want to stay in these clothes forever.